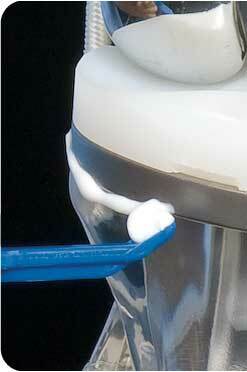 Using a scalpel to remove cement from small areas where bone meets implant can scratch the implant. Over time, these micro scratches can begin to compromise the integrity of the surgical procedure and reduce long-term wear. What is our real solution to this real problem? Whitney Medical Solutions' small No-Scratch Whitney Curette. The safe and easy-to-use, disposable No-Scratch Whitney Curette is perfect for quickly applying, manipulating and removing bone cement during hip and knee replacement surgery. It’s made of sturdy plastic reducing the risk of damage to the prosthesis due to metal instruments. Our one-time use curettes are economical and save time. No need to clean or scrape dried cement from instruments. Our small curette’s 6mm tip removes excess cement from replacement hips and knees. 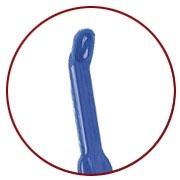 Easy-to-maneuver, the small blue curette lets you remove cement from all edges of the prosthesis. Made of plastic - sturdy yet softer than surgical steel. Each tool has a molded-in thumb indentation instantly orienting the tool. Easier to maneuver in hard to see places. Comes individually packaged in sterile, peel open pouch, ready to go. Applies, manipulates, or removes cement with fingertip precision. The cost of a single revision dwarfs the cost of a single-use curette. Disposable – there’s no need to waste time removing hardened cement or re-sterilizing tools. Less expensive to buy and inventory - order only the tool you use. Packaged 25 individually wrapped tools to a carton for convenient shelf storage. The No-Scratch Whitney Curettes come in four shapes designed to meet the needs of any surgeon.